A representative of a local alloys company will be at the Herkimer Working Solutions, 320 N. Prospect St. on Tuesday, March 26th from 10am to 12pm accepting applications and conducting on the spot interviews for various production positions including Kiln Operators and 3rd Shift Tailors. References/Security/Drug Test/Employment Test. Please bring a resume. Assist in set-up of production machines daily per established procedures; Assist in operation of production machines; Manipulate controls in an efficient manner to minimize waste; Detect & report machine malfunctions promptly. High School diploma or its equivalent and one year of any kind of manufacturing/production experience. An equivalent combination of education & experience will be considered. Must have reliable transportation to and from work. Our Technicians keep our business running day in and day out, connecting customers to the technology and communications services that they need while laying the groundwork for our company’s continued growth. This position will involve the installation, maintenance and repair of plant facilities both buried and aerial, according to specifications. Wednesday – Sunday. The hours will average 30 per week. Would like at least two years experience in the kitchen. Small 48 seat venue that serves gourmet burgers, and gourmet meals. all food is made from scratch, farm to table. Must have prior cooking experience. Must be able to follow instruction from head chef and keep inventory sheets daily. Pay is will commensurate with experience. Must have valid transportation. Reference/Security Check and drug test required. Summary: This role will be responsible for a variety of basic to moderately complex engineering work in planning and overseeing manufacture, construction, installation, operation, and maintenance of electric or electronic components, equipment, systems, facilities, and machinery. manages the installation and startup of new electrical systems as well as equipment upgrades. Summary: Fix and maintain the Highway Department’s vehicles on a day to day basis. CDLB or CDLA driver’s license, welding skills, reference check, physical exam, drug test, and background check required. Winter shift 7 am-330 pm Monday-Friday; summer 6 am-430 pm Monday-Thursday. Some overtime. Wage: Discussed at interview. Full benefits and clothing allowance. The position could become full time in the future. The hours are 7-3;30pm. The selected candidate would sort recyclables into specific categories. The selected candidate must be able to frequently lift up to 10lbs and occasionally lift up to 50 lbs. Candidate must be able to walk; to place recyclables in required location. Must be able to stand for a period of time, stoop, and have fine hand manipulation; grabbing recyclables. Summary: Will need to know how to drive a fork lift and operate a saw. Will control and coordinate the daily receiving of raw material both TMP purchased and Customer supplied. Issue traceability numbers to material received. Operate a saw to cut material to required size. Issue raw material to the manufacturing floor. Experience preferred but will train. Pay dependent on experience. Work Days, Shift, and Benefits: discussed at interview. This is not your typical home care nursing job – there are no quotas, and the caseload is very manageable. You’ll be based out of our Utica, NY office, but you’ll also travel within Oneida County to perform client assessments and field staff supervisions. You’ll work with a great team, but have autonomy within your role. This position is responsible for the performance or delegation of initial evaluation of client needs. 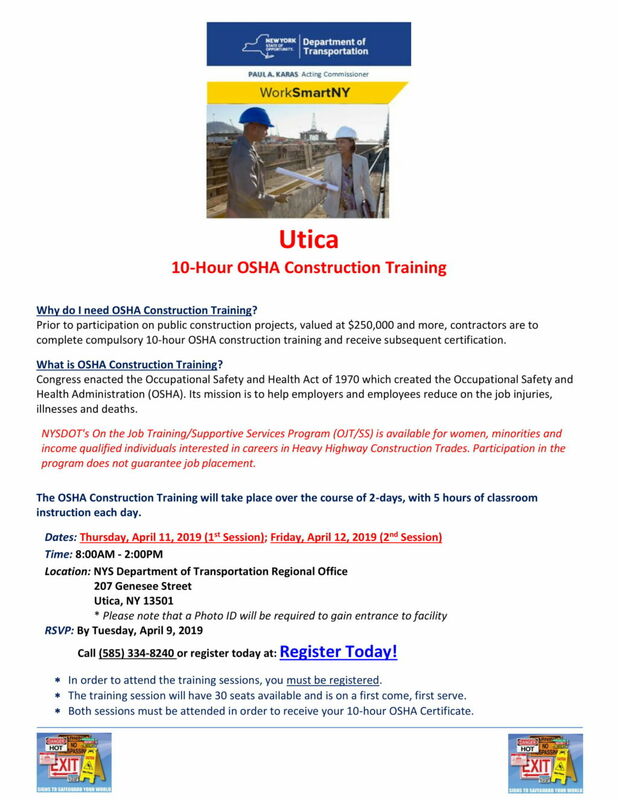 Next Week at the Utica Career Center! 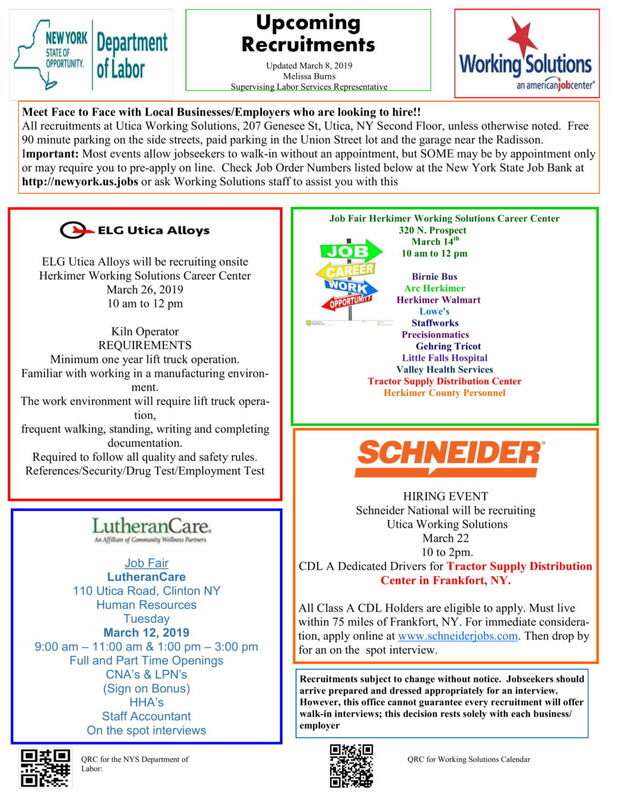 The Utica Career Center Job Fair is coming up on March 20th from 10 am to 12 pm at the Utica Career Center. We have a great line up of businesses again this month, including PinZ the new bowling/gaming bar/restaurant that will be opening soon in the Sangertown Square Mall! • Bank of America—Senior Customer Service Representatives, English; Senior Client Services Representative, Bilingual, English & Spanish. • Birnie Bus—School Bus Drivers, Driver Trainees and Monitors. • NY State Department of Corrections—Correction Officer Trainees and Medical/Nursing Staff. • First Choice Staffing—Clerical and Production Positions. • MVHS— Environmental Techs, Bio-Medical Techs, RN’s, LPN’s, CNA’s, Clerical. 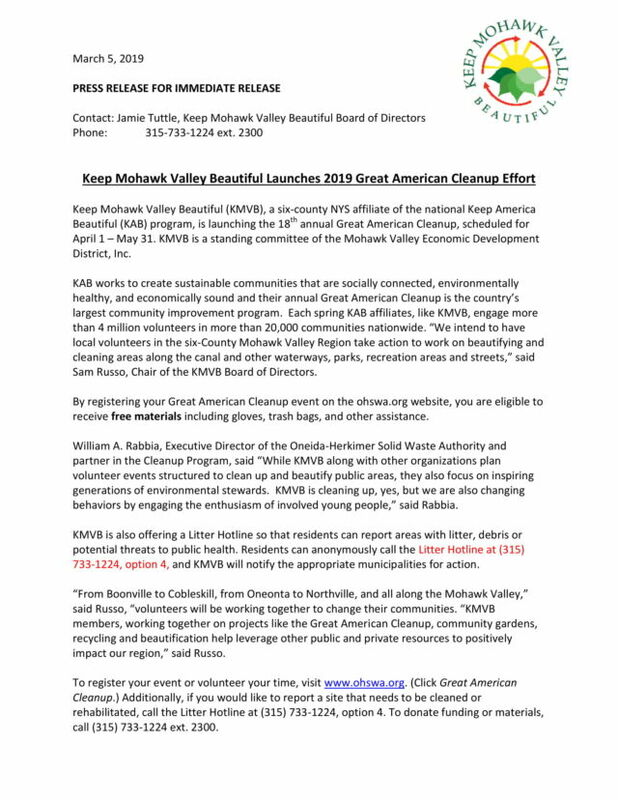 • Mohawk Valley Community Action Agency– Food Service Assistant, Assistant Teacher, Teacher, Nutrition Manager, Early Head Start Home Visitor, Teacher/Center Director, Coaching Specialist. • Janitronics—Cleaners both full and part time. • NY State Department of Transportation— Transportation Construction Inspectors. • Metlife—Claims Agents/Reviewers, Claims Specialists, Sales. • PinZ—Opening Soon at Sangertown Square Mall. Now Hiring: Bartenders, Servers, Runner/Busser, Game Tech, Facilities, Host, Cook, Dishwasher, Gaming, Counter Staff. • Vernon Downs—Gaming Workers, Security, Food Service. • Resource Center for Independent Living—Disability Rights Advocate, Administrative Assistant, Direct Support Professionals and more. • The Arc of Oneida Lewis—Assistant Manager, Residential, Habilitation Specialists, Direct Support Professionals and more. • ELG Utica Alloys—Kiln Operator, Third Shift Tailors. • Upstate Cerebral Palsy—Direct Support Professionals, Program Managers, Residential Counselors and more. • United States Census Bureau—Field Representatives, Various Locations. • Speedway—Management Candidates, Customer Service Representatives and Cashiers. ALSO: On Friday March 22nd from 10 am to 2 pm Schneider National will be at the Utica Career Center hiring dedicated CDLA drivers for the Tractor Supply Distribution Center in Frankfort, NY. Promptly reports for work and always checks with the off going supervisor to determine if there are any call-ins. Adjusts schedule accordingly to ensure proper coverage. Creates daily work schedules at least three days in advance ensuring that employees are rotated through the different duties. Maintains effective coverage of the entire Resort. Requirements: high school diploma and 3 years experience. Both full and part time openings for experienced and dependable Cleaners. Must have a valid driver’s license and reliable transportation, overtime as needed. Candidates will be reimbursed for mileage. Tips are possible. 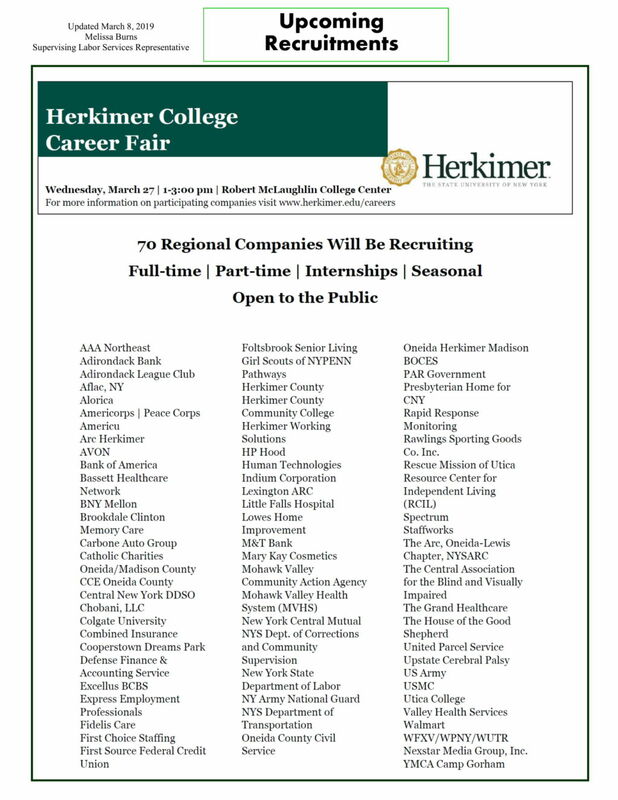 Positions need to be filled ASAP in the following locations; Rome, Utica, Liverpool, Cicero, Syracuse, Hamilton, Cazenovia and everything in between. Candidates must like to travel. Utica Recruitment Day is on Wednesday, March 20th from 10am-12pm at the Utica Career Center, 207 Genesee St. Utica, 1st floor. Twenty businesses with over 200 openings from various sectors including healthcare, manufacturing, human services, retail, and food service/hospitality will be on hand to offer you a new career. Please bring a resume and a valid ID for building entry. Work days will vary and include weekends and holidays. Duties include: Changing beds, dusting and vacuuming. Cleaning bathrooms-toilets, sink, shower and mopping. Taking out garbage and carrying laundry up and down stairs. Requirements: Must be physically capable of performing all job duties. Reference/security check required. Must possess the ability to lift heavy objects in excess of 50 pounds. Knowledge of operating heavy machinery such as forklifts may also prove necessary. Only applicants 16 and older may apply. Summary: Recruit and contract independent carrier force for home delivery of the newspaper. Ensure customers are provided satisfactory delivery service by managing contract of the independent carrier force. Monitor customer service levels and implement appropriate actions to correct problems as they arise. Work Days: Wednesday through Sunday from 3am to 11am. Qualifications: High school diploma or equivalent and a minimum of one year supervisory experience. A representative of a national trucking company will be recruiting CDL A Dedicated Drivers on Friday March 22nd and from 10 am to 2 pm at Utica Working Solutions Career Center, 207 Genesee Street, 2nd Floor. All Class A CDL holders are eligible to apply. Must live within 75 miles of Frankfort, NY. For immediate consideration, apply online at www.schneiderjobs.com then drop by for an on the spot interview. Summary: Troubleshoot, repair electro-mechanical equipment and assist, interface with the maintenance, engineering staff with the design, programming, retro-fitting and construction of PLC controlled automated equipment. Program electrical controls, diagnose, analyze electro-mechanical problems and perform repairs. Troubleshoot/repair a wide variety of electro-mechanical automated assembly equipment. Requirements: Associate’s degree and 3 years experience. Interested in Tai Chi? 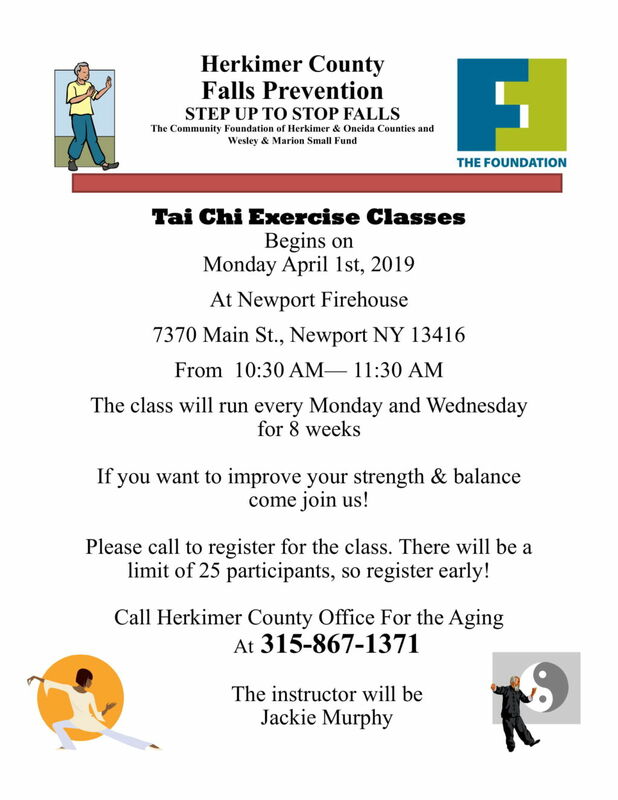 Beginning on Monday, April 1st there will be Tai Chi Exercise Classes from 10:30 am – 11:30 am at the Newport Firehouse on every Monday and Wednesday for 8 weeks. Spots are limited so be sure to register today! 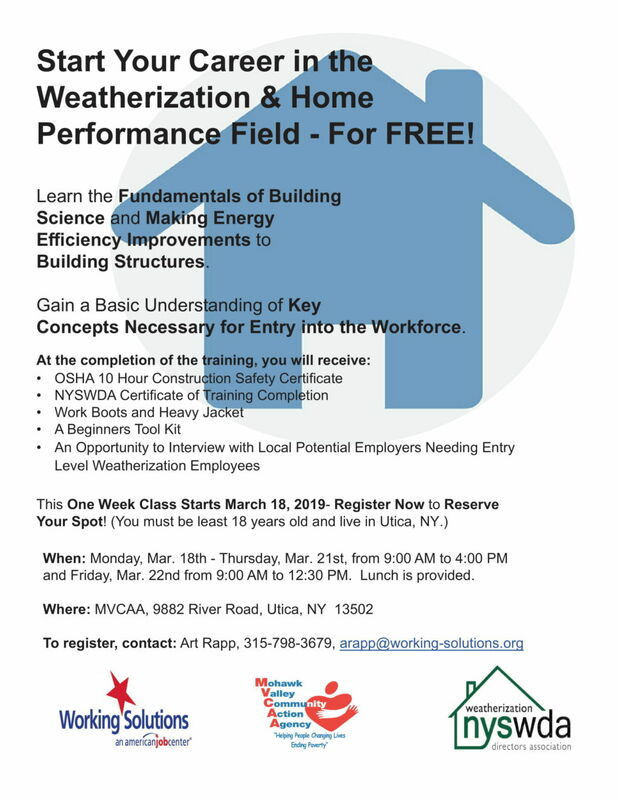 Start your Career in the Weatherization & Home Performance Field for FREE! Immediate need. Full or part-time position for a Mexican restaurant in New Hartford. Responsible for line work, saute, frying and performing other duties as necessary. Hours are in a 10:00am to 11:00pm time frame; days can vary. High School diploma or GED required. Employer will train an individual with the right attitude. Pay will will be based on qualifications. A secondary metal processing facility is seeking a safe and courteous professional individual to join our team as a route driver. Minimum requirements: The selected candidate must possess a CDL A license with five years of verifiable experience. Candidates cannot have any serious traffic violations within the last five years or any DUI/DWI violations within ten years. Must be able to pass a background check and drug testing. Must be able to deliver freight to and from Canada as required. A local plastics company will be hosting an Open House at their location, 120 Barlow St. Canastota on Wednesday March 6th from 9am-11am and 5pm-7pm and also Thursday March 7th from 9am-11am. Openings include Facilitators, Casters, Machinists, Maintenance Technicians, Supervisors, Secondary Operators, Quality Technicians, and HR Generalist. Interested applicants are encouraged to attend. Full or Part-time position for a restaurant in New Hartford. Responsible for serving customers, taking orders, assisting with preparation as needed. High School diploma or GED required. Hours and days may vary. Hours will be between the following hours: Sunday – Noon to 9:00pm; Monday to Thursday – 10:45am-10:00pm; and Friday to Saturday – 10:45am-11:00pm. Flexible scheduling- could be days or nights depending on candidate availability. Employer will train the right individual. Summary: Part time position. Our Delivery/Distribution Assistant will be responsible for assisting with receiving and unloading papers when they arrive. Distributing papers to our carriers and contractors. Delivering open and down routes. Delivering papers to customers who were missed or shorted. Will be scheduled to work 29 hours a week, from approximately midnight to 8AM. Must have a valid driver’s license. Summary: responsible for mopping, sweeping, vacuuming and washing floors, stairs, hallways, elevators, and restrooms. The individual will also collect and dispose of trash and garbage, and empty waste baskets. Filing towel dispensers, striping and refinishing floors, washing blackboards, sinks, and other fixtures is also required. In addition, the applicant will clean venetian blinds, mirrors, and bathroom fixtures and take soiled linens to the laundry. Summary: Immediate opening. Full time position. Days and hours: Monday through Thursday, 8am to 4:30pm; Friday, 8am to 3:30pm. Duties: Apply photographs to a Mat Board according to a specific number location. Requirements: High school diploma. Must have a good eye for color and attention to detail. Also looking for a Data Entry worker with excellent typing skills. Summary: Clean, mop, disinfect, sweep and vacuum, to food grade specifications throughout production area on a routine and daily basis. Physically able to lift 75 pounds, bend, reach, and stand throughout the shift. High school diploma/GED, valid driver’s license, reference/security check, physical exam, drug test, and at least two years’ experience with commercial cleaning equipment required. Summary: Prepares menu items according to defined recipes without variation and performs a number of kitchen activities including pot washing, dish washing, general cleaning duties and storing food and non-food supplies: Prepares all food items to order, following standard recipes and procedures. Prepares all food items as directed in a sanitary and timely manner. Follows recipes and portion controls. Summary: A company in Cazenovia is seeking a candidate to work at their facility. The selected candidate should have some plumbing and heating knowledge. The selected candidate must be amendable to training. The selected candidate must be mechanically inclined and must be able to meet the physical requirements of the job; kneeling, standing, walking, lifting, crawling as needed. 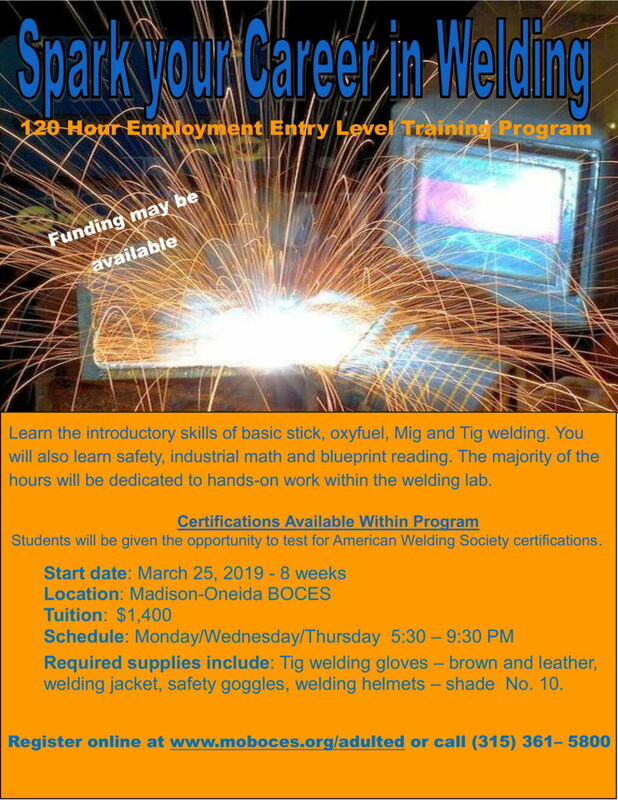 Interested in a career in welding? Madison-Oneida BOCES is offering a 120 hour employment entry level training program that will begin on March 25th and will run for 8 weeks. Certifications are available within this program. If you’d like to register go online at www.moboces.org/adulted or call (315) 361-5800. 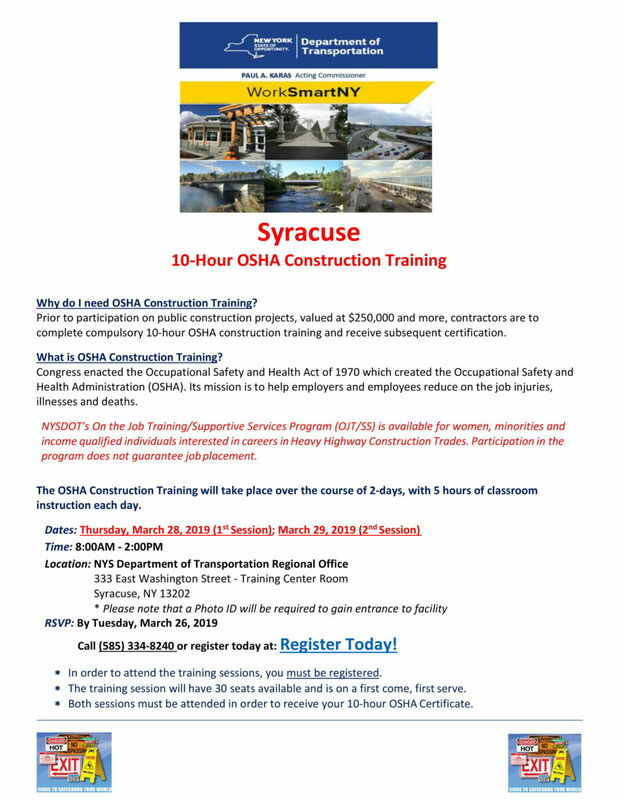 The Department of Transportation is offering OSHA 10 Training in Syracuse in March and Utica in April. NYSDOT’s On the Job Training/Supportive Services Program (OJT/SS) is available for women, minorities and income qualified individuals interested in careers in Heavy Highway Construction Trades. Participation in the program does not guarantee job placement.